As the postcard above depicts, the cottage homes built by Greenwich and Deptford Union, although built as cottage homes, were know from the outset as 'children's homes' and not 'cottage homes'. This appears to have been unusual amongst cottage homes, at least in years preceding the Second Word War. 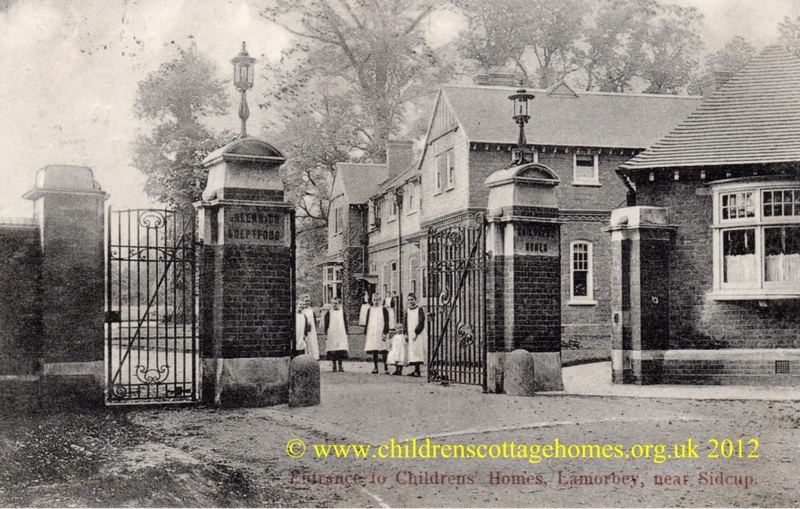 The cottage homes were opened in 1902 on Burnt Oak Lane, in Sidcup, Kent, an area which was known as Lamorbey. There were 25 large houses for children - 20 for girls and 5 larger homes for boys with a school, gym and a swimming pool for children as well as a water tower. The postcard at the top of this page, has a postmark dated February 1907 and carries the message shown on the left. "I shall be pleased to see you on Wednesday afternoon. I should like you to fit the skirts on too if you could. I have fresh children in so am very busy. It was posted to a woman in Deptford, presumably a seamstress. 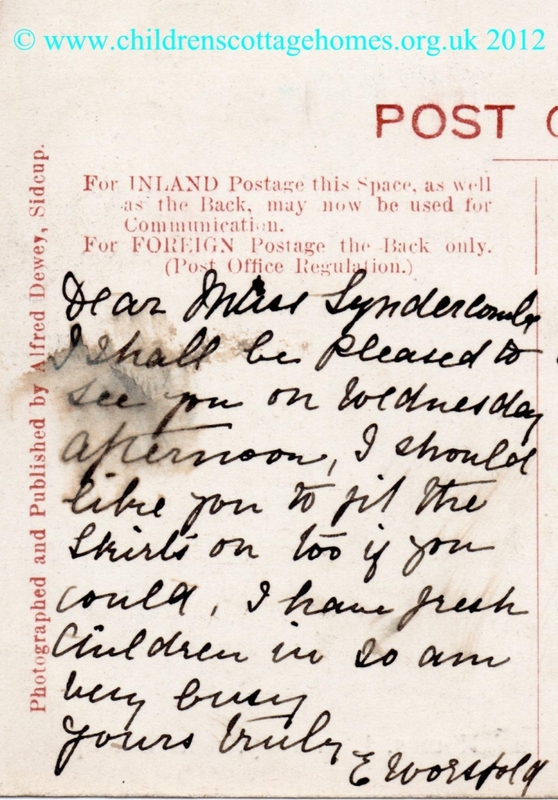 E Worsfold was perhaps a foster mother of one of the houses or perhaps the superintendent of the children's homes. The Hollies was the name of one of the main buildings of the children's homes and already existed before the site was bought by the Poor Law Union and the rest of the houses were built. All the houses were named after trees such as Larch, Poplar, Pine, Palm and Rowan. They were arranged around a green and had the relevant tree planted in front of each house. 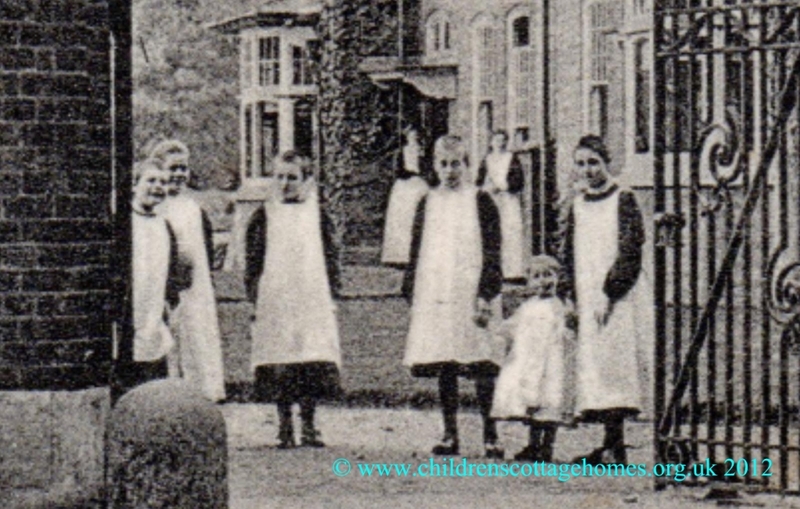 The children's homes became known as the Hollies children's home in the 1950s. The Hollies building was demolished in 1990s. The other houses of the cottage homes closed as children's homes in the 1980s but the buildings are still standing. The records of the Hollies are held at the London Metropolitan Archives.